The name Wacom is synonymous with digital tablets and sketch pads, and the company has its latest model for the masses announced recently – the Wacom Inkling. This spanking new digital sketch pen will be slightly different from your average digital tablet, as it will actually be able to capture a digital likeness of your work even when you sketch with Wacom’s provided ballpoint tip onto any sketchbook or standard piece of paper. Yes sir, this is one model that targets those who are into rough concepting and creative brainstorming stages, where the Inkling intends to bridge the gap between paper sketching and digital drawing as it offers users at the beginning of the creative process a method to actually flesh out the ideas swimming in their heads on actual paper, while capturing those concepts digitally at the same time so that they can be further refined on a computer. This definitely beat the old school method of scanning your images onto a computer for inking and refinement later on. Heck, even Inkling enables users to develop layers in the digital file while sketching on paper using the following creative software applications – Adobe Photoshop, Adobe Illustrator and Autodesk Sketchbook Pro. The Inkling is definitely an interesting device for those who want to capture all impromptu creative ideas, turning them into a digital format so that they can e-mail, archive or further refine it on their computer at a later time. 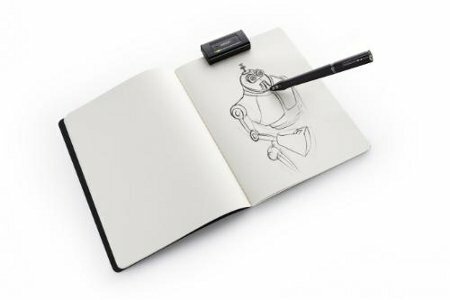 The Inkling digital sketch pen will consist of both hardware and software segments – where the hardware includes the pen and a wireless receiver which will help capture a likeness of the sketch while stashing it away digitally. As for the ballpoint pen from Wacom, it relies on the company’s very own pressure sensing technology (up to 1,024 levels of sensitivity) in order to detect just how hard the pen is being pressed to the paper while sketching. The pressure variations will be translated into the digital version of your drawing without missing a beat. As for the receiver, it will be clipped right to the edge of standard paper or sketchbooks, where the position can be placed at the proper position to cater for both right handed users as well as southpaws, providing them with an uninterrupted line of sight with the pen tip. Once the sketching is done, the receiver will be connected to the user’s computer via USB in order to perform a transfer of the digital files. The Wacom Inkling will retail for $199 a pop from the second half of September onwards if you are interested in expanding your artistic horizons.